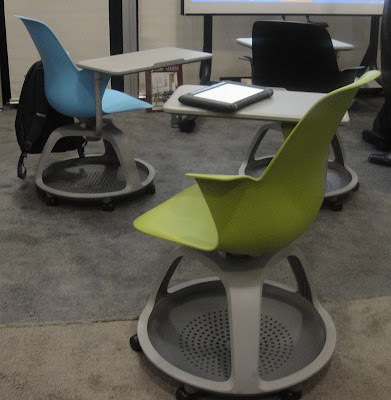 New student lecture seats were revealed by SteelCase - a very advanced form of the standard lecture chair (see below). Not only are they really very comfortable with a flexible back, but they are on wheels for ease of movement, have an integrated bag shelf, swivel, with swivelling desk top that can fit either side. For those that like this style they are really worthy of a good look - but they are not cheap! However, the absolute runaway star of the show regarding seating was the new HOKKI stool by VS, the leading schools furniture manufacturer from Germany. The new stool was immensely popular - it's rounded base ensures that those who sit on it can move easily therefore ensuring better posture and focus. Initially I was not convinced when I first sat on it - but a second visit changed my mind. Judging from the queues of delegates lining up to get one, they were not the only ones! They are on sale from VS but will also be on Amazon in a couple of weeks. What IS really fab is that the ongoing focus on ergonomics and concern for student furniture can only be good and contribute to an improved learning environment and outcome for all. Four young students from Accrington Academy not only made history this week, but also dominated the main stage at the start of the cefpi World Conference in San Jose, California, receiving the only standing ovation of the day from the several hundred delegates. 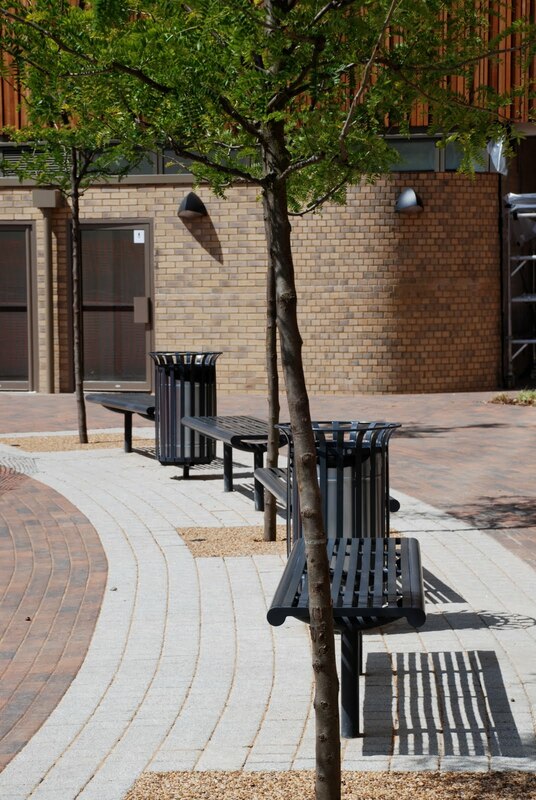 (cefpi = Council of Education Facilities Planners International). It has been fairly unusual for young people to be included in this annual conference, and when they do, they have normally featured in side seminar sessions. For the AccringtonAcademy youngsters to be a formal part of the official opening presentations and speaking with real authority and clarity on some fairly sophisticated design concepts is a first for as long as I have been attending this conference. And boy, did the delegates just love them! They spoke with real passion on their engagement in developing ideas for a new eco-friendly, sustainable building for their new school, setting up their own group called 'Roots', challenging the community to get involved and very positively leaving a legacy for future students and people of East Lancashire. It is, frankly, rare to hear students discuss the 'zero carbon pyramid', aiming for a carbon positive building, identifying the reasons behind their choice of wood and recycled materials to create a building that will reduce water and energy consultation, aiming to collect all energy data for analysis, educate learners and friends, the reasons for the attenuation pond, straw bale insulation, wind turbines, green roof, only using locally sourced products, (including collecting tyres for use (by rolling them - not getting a truck!! ), creating a green travel plan, and .....so much more. This was not just a list of key words or jargon being reeled out - they clearly knew what they were talking about. Some of them had been engaged with the project for three years, and so impressed their local area councillors that they are considering using young people in some other council projects. How wise of them I suggest! Supported by the just fabulous and inspirational company 'classofyourown' ** (who have been deeply involved with this project), these learners just captivated the hundreds of architects, builders, education representatives. The ongoing exceptionally active 'Twitter' stream was so positive that people following it from outside the hall stopped what they were doing and joined the other delegates. This level of student engagement is relatively rare in the US, although some of that is beginning to change. But even then, the discussions do not achieve this level of detail and understanding. The fact is that our young people really do have: very clear views, high aspirations and some really good ideas! They have challenged their staff, constructions partners and the community. This really is how it should be in every project. Everyone in this project has learnt a lot - and this should translate into ongoing continuous improvement on future projects and ambitions. There were many people in the audience who agreed with the cefpi President's closing comments that started with "Wow" but ended with wondering if there were several hundred people in the room that wanted to offer the team jobs straight away - most decided that maybe she wasn't joking!!! The presentation was only the start, for the next two days the young people manned a small exhibition describing the plans in detail. This allowed hundreds of professionals to talk, question, probe and explore the project in real detail with the team - they certainly held their own and so so impressed everyone. Special recognition for them and this project includes: cefpi - Special Recognition for Outstanding Accomplishment (USA), Lancashire Business Environment Award (UK) (Highly commended) and they are currently shortlisted for other Community Responsibility and Environmental Champion competitions. This is what learning should be about: a project with value and relevance that has really engaged the team, collaborative working with other young people and adults, ambition, student led learning and aspiration, global links and so on. There is no doubt that the experiences that these young people have gained on this project will have a major impact on them personally, their confidence and their plans for the future. I have seen a lot of versions of students engagement - this is the best example of real meaningful engagement that I have seen and will be hard to beat! Just a massive well done to the students and staff of Accrington Academy and 'classofyourown' who supported them. classofyourown is a company specialising in projects and workshop concerning sustainability, construction and industry issues. Workshops with schools enable learners and their teachers to address sustainability in a very practical way. Judging by this work - they are really succeeding! 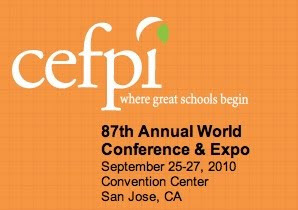 So the talking has started at the cefpi World Conference in San Jose, California. Even after just a few minutes here, literally, I was delighted to meet up with a number of old friends including Randy Fielding, Ewan McIntosh and Christian Long. As always I am also meeting loads of new people, all interested in the same priority; making learning better for students. It's a great opportunity. Interestingly, there have been a number of people from various aspects of of IT, including Ewan and DK from UK based Mediasnackers. This just has to be positive - the lack of ICT representation at cefpi has been an extremely conspicuous gap in the last few years apart from the occasional key note speaker such as Professor Stephen Heppell. This is especially true when compared to the UK where there has developed a much greater defined process in an integrated approach to education, ICT and school design. There is a way to go here in this approach in many cases. Mediasnackers are experts in the use of social networking, working with anyone who wants to work differently - no wonder that they are busy! This really is an area that schools are going have to explore far more and be brave in adopting new approaches. There are examples of this, but no where nearly enough and usually to a very limited extent. This is bonkers as so many young people use it all the time out of school - why shouldn't schools harness this expertise and use it for the better? I will post more about the conference as it proceeds, but if the start is anything on go by, it promises to be a truly fantastic event! Frequently issues are caused by the location of lockers around schools due to them not being 'designed in' during the initial build process. This is especially true in older buildings and as a result they are often 'dumped' into major circulation routes, which exacerbates crowding issues at peak movement times. Many people want them in classrooms, as this allows just a few lockers in one location and encourages better supervision. Frequently though classrooms are either not large enough or there are not enough lockers for large groups or there are access issues if the room is locked and the teacher not around.Whilst this is a school management issue, it often can become an issue for both staff and students. In one meeting I attended some time ago, one architect thought it a good idea to put all the lockers in one location for easier supervision. One thousand lockers = one thousand students in a hurry in one space at the same time - he almost seemed surprised when I made a few concise strong comments! He has yet to take up my offer of visiting a school so he can watch traffic flow around lockers at the end of the day. When lockers are designed into a build then there is much greater chance of sensible and effective locations, that minimises crowding, damage and foolishness. 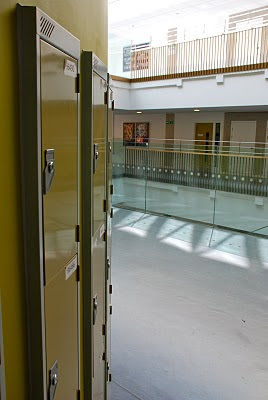 So the best lockers I have seen in any school recently are some of those in the new Highbury Grove School in Islington. Here they have been designed and built into a large curving wall within a circulation area and colour used really effectively. They look great and look as though they were designed to be there. The curve naturally gives a little space between them and , of course, therefore people. They are not all like this - there are several banks of lockers in recessed areas located around the school as happens in most schools. However, I am not sure why the others in circulation areas aren't built in as above as well - it gets rid of the dust traps (and litter) on top of them and makes them look like a deliberate fixture. 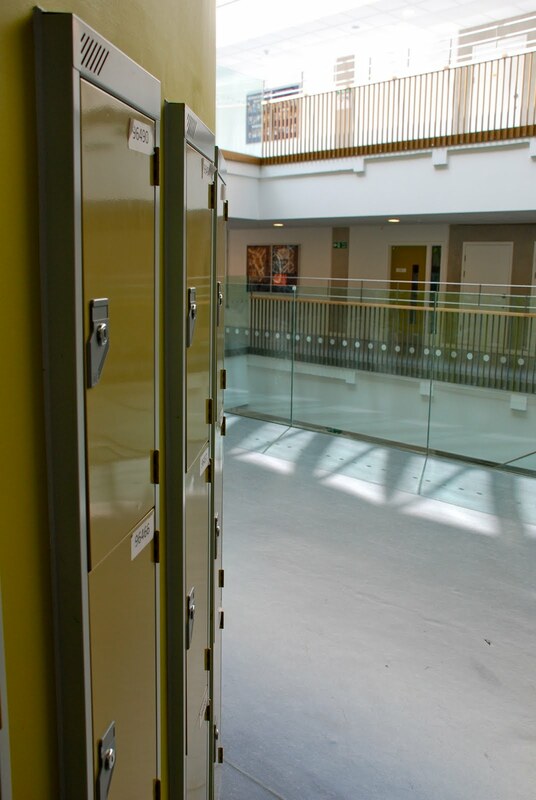 Schools all over the place are looking for solutions to the locker issues including: finding lockers with sloping tops to avoid the litter trap issue, finding low level lockers with transparent tops for use as display cases and so on. Building them in as in these photographs may just be a really neat solution!